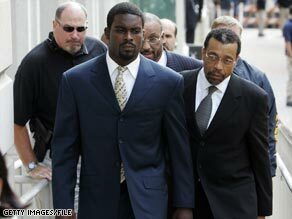 Michael Vick, left, arrives at federal court with attorney Billy Martin in Richmond, Viriginia, in 2007. When Michael Vick completes home confinement in July, he will have served the 23-month prison sentence imposed after he pleaded guilty to federal dogfighting charges. After his release from a Kansas prison Wednesday, he headed to his home in Virginia to serve the final two months under home confinement, because all the beds at halfway houses in the area are taken. But that hasn't deterred the Vick haters who are still in an uproar over the heinous details of his dogfighting kennel. Yes, reading the details of the treatment of the dogs, including the killing of some of them, could make anyone sick. Yet what's the point of sentencing someone to jail, then having them serve their time and be released if we still want to imprison them for the rest of their lives? Frankly, I'm sick of Americans who talk all day about "do the crime, then do the time," then still want to treat a man like a criminal when he gets out of prison. Michael Vick gets a second chance, but what about his dogs? Editor's Note: The Philadelphia Eagles welcomed Michael Vick back into the National Football League on Friday after the quarterback spent almost two years in federal prison on a felony dogfighting conviction. John Polis, of the Best Friends Animal Society, blogged about the fate of the dogs a few months ago when Vick was released from prison. 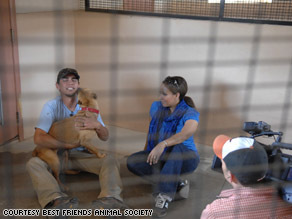 Best Friends trainer John Garcia and Georgia, one of the dogs living at Best Friends Animal Sanctuary. Former grand champion fighter Lucas has found a new life at Best Friends Animal Sanctuary. When Michael Vick emerges from Leavenworth today after a two-year sentence for dog fighting, all eyes will be on the former Virginia Tech college star, who went on to quarterback the Atlanta Falcons for seven seasons. Will he play again? At 29-years-old, will they switch him to wide receiver? Will his return to the game help or hinder ticket sales? But amid all the hoopla about Vick’s future in football, what about the victims, the dogs that were mistreated, tortured, and, eventually, killed when they were no longer profitable as fighters? What happened to them? Does anyone really care? At Best Friends Animal Sanctuary, located in the pristine high desert county of southern Utah, 22 of the toughest cases from the Vick fiasco are rewriting history when it comes to the reputation of fighting dogs. 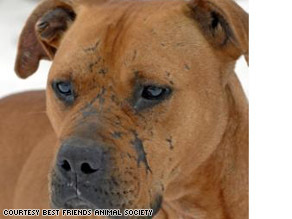 Prior to their coming to Best Friends, it was a widely held opinion – by the most highly-respected animal welfare groups in the country – that any dog rescued from a fighting situation should immediately be put down. After the Vick bust back in 2007, Best Friends and other groups that advocate for the pit bull breed, contacted the U.S. District Court of Eastern Virginia with an alternative. Would it consider allowing groups who knew pit bulls to take the dogs instead of euthanizing them? Thankfully the answer was yes, and today, the dogs at Best Friends are making terrific progress. Program Note: Tune in tonight to hear Randi Kaye's report on what happened to Michael Vick's dogs on AC360° at 10 p.m. ET. The organization BAD RAP (Bay Area Doglovers Responsible About Pit Bulls) was formed in 1999 to rescue and redeem American pit bull terriers. The organization helps Bay Area residents adopt Pit Bulls and uses training sessions designed to socialize dogs and make them suitable for life as a pet. After fighting pit bulls were taken from football star Michael Vick's Bad Newz Kennels, BAD RAP took part in evaluating, training and finding homes for the dogs. Watch this video of some of the dogs that were originally owned by Michael Vick. Go to the BAD RAP web site to see a timeline of the dogs' healing process.